The Doukas family rose to power after the emperor Isaakios I was persuaded to appoint Constantine Doukas as his successor over his brother John. The Doukas family had their roots in Paphlagonia and had served as governors and generals. As an imperial dynasty the Doukai did not shine. Under Constantine X the Normans began their conquest of Italy, the Uzes raided across the Danube, and the Seljuk Turks made advances in Armenia. The situation in the east continued to deteriorate during the regency of Constantine's wife, Eudokia Makrembolitissa. Eventually Eudokia married Romanos Diogenes in the hope that a strong military man would restore the border in the east and repel the Turks who had been raiding around Antioch and Caesarea. Under Romanos IV, who ruled alongside Constantine X's sons, the Normans captured Bari, the capital of Byzantine Italy, and the Turks sacked Ikonion and Chonai deep inside Byzantine territory. In 1071 Romanos fought the battle of Manzikert against the Seljuk Sultan Alp Arslan and was defeated and captured. The Doukas family saw this as a chance to rid themselves of Romanos and proclaimed Constantine X's eldest son Michael as senior emperor. Romanos, freed by Alp Arslan was captured and blinded. Michael's reign saw the beginnings of the conquest of Anatolia by the Turks as well as rebellions throughout Anatolia and the Balkans. Eventually one of these rebels, Nikephoros Botaneiates proved capable enough to overthrow Michael in 1078. The seals of the Doukas family include the dynasty in a way that was new to imperial seal: the inscription includes the family name. 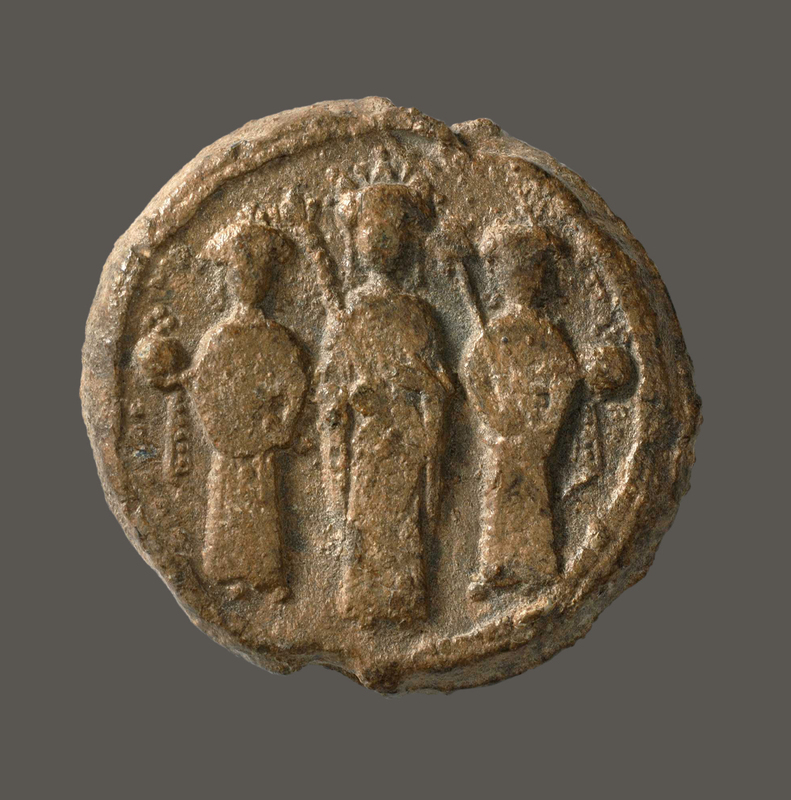 Family names began to appear in Byzantium as early as the eighth century, but increasingly appear on seals in the ninth and tenth centuries. 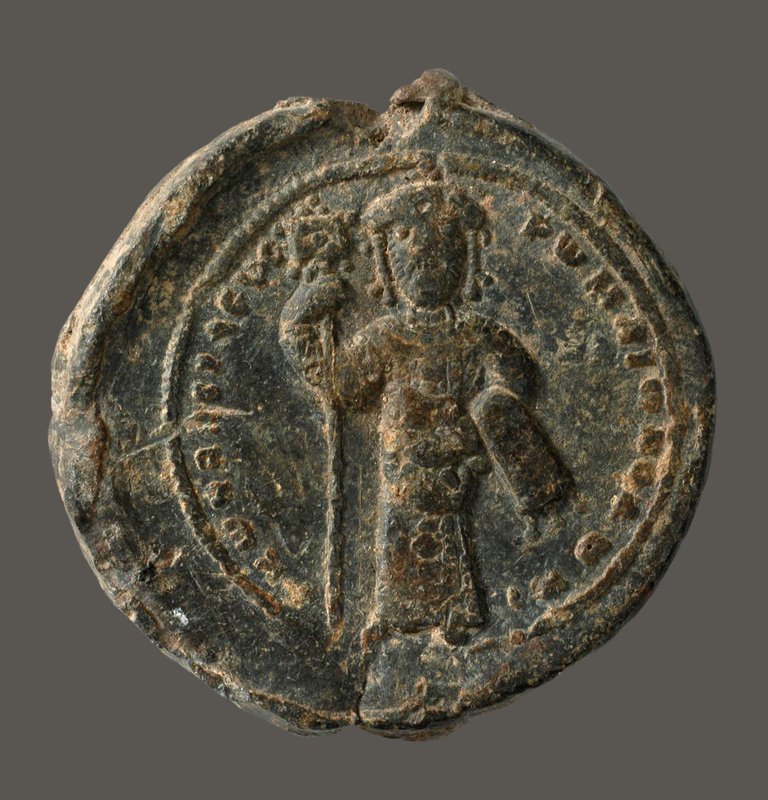 The first emperor to include his family name on seals and coins was Isaakios I Komnenos, and the practice was continued by all future rulers, starting with his successor Constantine Doukas. The identification of emperors as members of a larger family, and the privilege of those family members, underpins the transformation of the imperial office by Alexios I. But a premonition of this political change is already present in two groups of seals from 1067 to 1071. The first depicts Constantine X's widow, Eudokia Makrembolitissa with his two sons and co-emperors Michael VII and Constantine, while the second retains these figures and adds Romanos IV Diogenes and Constantine X's third son Andronikos. Romanos IV, the nominal emperor from 1068-1071, is visually reduced to equal status with Eudokia and Michael VII. The assertion here is clear: Romanos's role is meant to be that of regent rather than emperor, and the throne belongs to the Doukai. The brief expulsion of the Doukai from the imperial office by Nikephoros III was quickly reversed by the usurpation of Alexios I, who united the Komnenoi and Doukai families with his marriage to Eirene Doukaina. 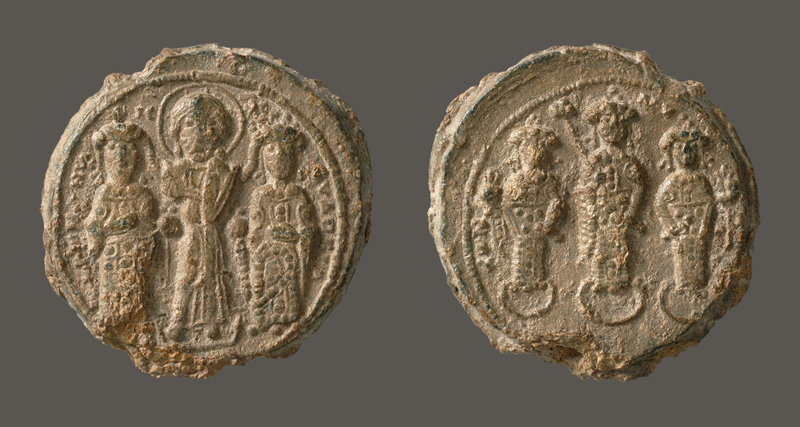 Although the visual program of the Eudokia Makrembolitissa and Romanos IV seals would not return for the remainder of the empire's existence, the ideology and pretension that it conveys found its full fruition in the reforms of Alexios I.